If you prefer a standard lay-down tub but want the safety that Sanctuary walk in tubs offer, then AmeriGlide has the solution for you with the Sanctuary Full Bather Walk In Bath Tub. 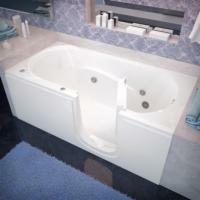 This full bather is a walk-in tub replacement for a standard lay-down tub and uses your current tub's faucets for filling (you must also provide the drain). The Sanctuary Full Bather Walk In Bath Tub has a swing-in door, a 5" step height, and a non-slip surface that lets you simply walk in the bath tub when you want to take a bath - no more stepping over the side of a tub onto wet surfaces. Rob the paramedic from Parkersburg, WV. would recommend this to a friend. Looking for walk in tub for later years. Doing a bath remodel and putting in tub for later years but will enjoy it now.